SCOTUS continues its usual June pace, with nine cases decided this week. One, Benisek v. Lamone, is a per curiam decision. A group of Republicans in Maryland filed a motion for an injunction, claiming an unconstitutional gerrymandering in a Maryland congressional district. SCOTUS affirms the denial of this motion, on two grounds. Firstly, the petitioners in this case simply waited too long. A preliminary injunction implies that a situation requires immediate action, but the petitioners waited several election cycles to fully pursue their aims. Secondly, there is no longer enough time before the next general election (five months from now) for the district map redraw that petitioners pursued here. In addition, the case of Leidos v. Indiana Public Retirement System was dismissed. 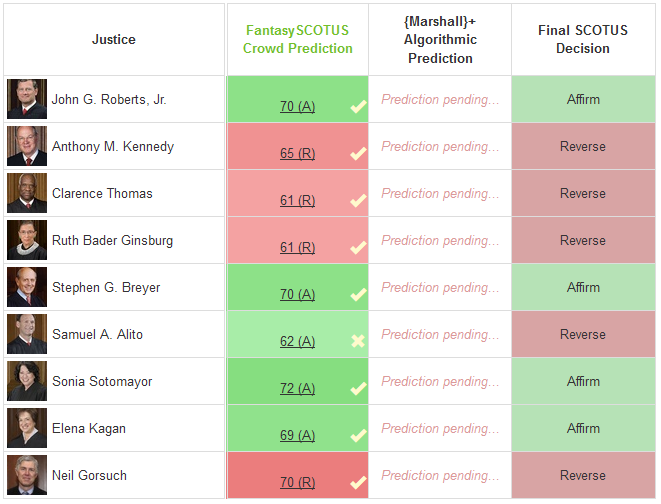 As with City of Hays, KS v. Vogt and Washington v. US, these cases will remain up on the FantasySCOTUS Case List, but will not be counted in our analysis for this term. Fane Lozman, an outspoken critic of eminent domain in Riviera Beach, filed a lawsuit alleging that the City Council violated open-meetings laws. He further alleged that council members initiated a plan to intimidate him. The situation came to a head with Lozman’s arrest during an open comment session at a council meeting. Lozman claimed his arrest was in retaliation for his opposition to the council. The District Court, and later the Eleventh Circuit, held that Lozman’s claim of a First Amendment violation of protected speech was defeated by a finding of probable cause for the arrest. Lozman makes a very specific claim. And SCOTUS writes that because Lozman “must prove the existence and enforcement of an official policy motivated by retaliation,” that his claim stands separate from typical retaliatory arrest claims. This specificity leads to a narrow ruling from SCOTUS. The Justices – in an 8-1 majority – rule that this unique retaliatory arrest claim requires additional supportive evidence of the city’s intimidation scheme against Lozman. SCOTUS also had to determine whether the existence of probable cause bars a First Amendment retaliation claim, but they demur from this as well, explaining that no guiding principle can be established in a case like this at this time. SCOTUS doesn’t necessarily agree or disagree with Lozman’s contention that the city council had it in for him. Rather, they vacate and remand the case to the Eleventh Circuit, which must address the evidence and arguments that may show some kind of official city government policy aimed at infringing Lozman’s protected speech rights. This case, and several others this term (e.g. Chavez-Meza below, Koons v. US, and Hughes v. US) continue the trend of SCOTUS cleaning up lingering issues after updates to the Federal Sentencing Guidelines. A District Court mistakenly counted one of petitioner Rosales-Mireles’ convictions twice. He was thus sentenced on a miscalculated range of 77 to 96 months, rather than a range of 70 to 87 months. While the Fifth Circuit discovered this error, and found that the error affected Rosales-Mireles’ rights, they nevertheless upheld the sentence. The Fifth Circuit reasoned that the error would not seriously affect the fairness, integrity, or public reputation of judicial proceedings. But the discovery of such a mistake – plain error – calls for a court to vacate a defendant’s sentence. Sotomayor, writing for the 7-2 majority, points to other Circuit Courts that have conducted these kinds of resentence proceedings under similar circumstances. In short, when a plain error occurs in a sentencing decision, the Circuit Court should vacate the sentence so a defendant can receive a new, more accurate sentence. To do otherwise risks an unnecessary deprivation of liberty. Thomas dislikes the possibility that the ruling in this case could open the door to frivolous appeals based on Guidelines errors. Plain error is meant to be a high bar to clear, but this rule may create so much flexibility that it incentivizes defendants to withhold timely objections and essentially escape their original sentence. Not only that, but the Sentencing Guidelines are just that: only guidelines. Courts should not be so restricted by the Guidelines that a plain-error standard can arise from a subjective misapplication. DHS is required to notify noncitizens subject to removal proceedings of the time and place of their hearing. In Pereira’s case, DHS sent him notice, but with a time and place to be determined later. That future notice never got to Pereira, however. When Pereira was arrested for a minor traffic violation years later, DHS moved to initiate his removal from the country. Pereira moved to cancel his hearing, citing a relevant statute that allows noncitizens to move to cancel their removal if they have been continuously present in the US for more than 10 years. Pereira had been in the country for over 10 years by that point. However, a “stop-time” rule triggered by the first notice DHS sent to Pereira means the years since then may not count. Pereira claims the intervening years do count toward the 10-year rule, because the notice he received had no time or place, and the other notice was lost in the mail. The Immigration Court ruled that the stop-time rule was triggered by the first notice. The Board of Immigration Appeals agreed with the Immigration Court. The First Circuit affirmed the Board, on the basis of Chevron deference to the Board due to ambiguity in the statute. But SCOTUS reverses, and with near-unanimity. They disagree with the lower courts about statutory ambiguity surrounding notices of removal proceedings. The relevant part of the statute clearly states that a notice to appear must contain a time and place where removal proceedings are held, which the notice Pereira received did not contain. If a notice to appear does not contain a time and place, then the stop-time rule is not triggered. This places Pereira above the 10 years required for a motion to cancel his removal proceeding. In a short concurrence, Justice Kennedy reproaches an emerging trend whereby lower courts too quickly rush to apply Chevron deference to government agencies where, as here, the amount of statutory ambiguity arguably does not reach the threshold to trigger Chevron. Under the Appointments Clause, only the President has the power to appoint certain governmental Officers. Administrative Law Judges (ALJs) of the SEC are not appointed by the President. Instead, these judges are selected by members of the SEC itself. When the SEC charged petitioner Lucia with several violations of securities laws, Lucia argued on appeal that his ALJ lacked constitutional authority to adjudicate his case. The lower courts denied Lucia’s appeals on these grounds, but SCOTUS holds that ALJs are subject to the Appointments Clause of the Constitution. Justice Kagan writes for a majority comprised of the conservative wing, joined in part by Breyer. She writes that ALJs have career appointment to their statutory positions, and they exercise the same kinds of discretion that other officers of the government do. The ALJ who heard and decided Lucia’s case, though, did so without a constitutional appointment. This means Lucia is entitled to a new hearing, in front of a properly appointed ALJ, or the entire SEC. This case does not overturn the authority of the SEC’s ALJs; rather, the problem SCOTUS resolves here is that the judge in Lucia’s case was not appointed the proper way. Thomas, joined by Gorsuch, writes a separate concurrence. He is wary of applying Freytag to all similar cases in the future. Freytag was correctly applied here, but in the future the Appointments Clause has a clear enough framework to make appointment of Officers a straightforward process. Breyer concurs with the judgment, but not with every piece of the Court’s reasoning. For one thing, he looks to statutory law, not the Constitution, for the resolution of this case. The SEC’s ALJs are supposed to be elected by the Commission itself, but the judge in Lucia’s case was selected by SEC staff. That reason alone is enough to drive Breyer to concur with the judgment. In the final part of his separate writing, Breyer is joined by Ginsburg and Sotomayor. In Part III of his opinion, Breyer writes that it is not necessary to have a different judge hear Lucia’s renewed appeal, as the majority has ruled. Sotomayor draws attention to the lack of sufficient guidance in general when it comes to defining who qualifies as an “Officer of the United States”. Decision-making authority must be more concretely defined in order for Congress and the Executive Branch to discern who is an Officer of the government, and who is only an employee. And something else: the SEC’s ALJs issue only “initial” decisions, and for this reason are not full Officers. These initial decisions can only be made final when the Commission enters a finality order. A judge must always state their reasons for handing down a particular sentence. A sentence should be based on the Sentencing Guidelines, but as we’ve seen today and in Koons and Hughes recently, a judge has a lot of discretion on this. That discretion extends to the level of detail in the explanation for their sentencings. This case presented to SCOTUS the question of exactly how much detail a judge must reveal. The judge reviewed the Sentencing Guidelines, and determined a sentence at the bottom of the range. When the Guidelines were reduced, and Chavez-Meza asked for a commensurately reduced sentence, “the judge did so, but to a point still higher than what petitioner requested.” The Court of Appeals affirmed the original sentence, and the adequacy of the judge’s provided reasoning. A judge must state their reasons for a sentence, Breyer writes, but the “appropriateness of brevity or length, conciseness or detail, when to write, what to say, depends upon circumstances.” In Chavez-Meza’s case, the judge’s explanation fell within the confines of judicial discretion and professional conduct for a sentencing judge. Justice Kennedy dislikes the opacity of the forms judges fill out to explain their sentencing decisions. These forms fail to provide sufficient information, especially if a court resentences someone based on reasoning that differs from the reasoning in the initial sentence. Morever, establishing better rules for resentencing would increase court efficiency in general. Congress passed the Railroad Retirement Tax Act after the Great Depression. This Act taxed railroad employees on only their compensation, at a time when railroads provided other benefits to their employees beyond mere compensation (e.g. food, lodging, railroad tickets). Many current railroad employees now receive stock option plans in addition to other employer-provided benefits. This case arose because the Act is unclear on whether stocks qualify as compensation, in the same way that ordinary money does. Should railroad employee stock option plans be taxed the same as their monetary compensation? Gorsuch writes for the majority, providing a handful of analogies and logic problems that ultimately reject the government’s case that Congress wrote the Act to include these stock options as taxable. The ordinary meaning of the word “money” is enough to exclude stock, which cannot be used like money. The majority also rejects the dissent’s argument that the holding here would restrict new applications of the definition to new forms of exchange, e.g. electronic transfers of funds. The majority sees no problem with that, since an electronic transfer easily falls – both by definition and by common sense – into the definition of “money”. The dissent focuses less on the word “money” in the Act and more on the word “compensation”. Read this way, it becomes obvious that stock options should qualify as money remuneration. The OED, for example, defines money as “property or possessions of any kind viewed as convertible into money.” And under that definition, stock options would certainly count. Stock options are a financial instrument just like money, and they are commonly understood to be a form of compensation. This case concerns the usage of the Efficiency Gap in assessing allegations of partisan gerrymandering in congressional redistricting. Or, at least, that was the original goal of the petitioners. A group of Wisconsin Democratic voters claimed that a statewide act regulating district mapping “generated an excess of wasted Democratic votes, thereby violating the plaintiffs’ First Amendment right of association and their Fourteenth Amendment right to equal protection.” The respondents here, members of the state election board, moved to dismiss the plaintiffs’ claim due to lack of standing. A District Court denied defendants’ motion, and concluded that their redistricting plan was in fact a partisan gerrymander. The ruling is unanimous, except with respect to Part III. Thomas and Gorsuch break from the pack on the subject of dismissing the case, which in their view is more appropriate here than the remand the majority ultimately decides upon. Kagan writes separately to elaborate on a few themes Roberts’ majority opinion mentioned. This concurrence clarifies what a plaintiff has to do to show First Amendment standing: they must demonstrate a burden on their individual votes. Dilution via packing or cracking is the mechanism by which partisan gerrymandering operates. So the proper avenue for an individual to show injury, is to have a claim based on that criterion. Several of the plaintiffs in this case alleged “that they lived in packed or cracked districts. But for whatever reason, they failed to back up those allegations with evidence as the suit proceeded.” With a more detailed explanation of the individual legal rights that would assert standing, a suit like this could continue. A South Dakota Act requires out-of-state sellers to collect sales tax “as if the seller had a physical presence in the state.” This Act only applies to businesses that annually deliver goods and services over $100,000, or conduct more than 200 separate transactions. Respondent companies have no physical presence in South Dakota, and so a trial court granted summary judgment to the respondents. South Dakota appealed to SCOTUS, asking the Justices to review decisions in Quill v. North Dakota and National Bellas Hess v. Department of Revenue of Illinois. These two cases established a rule that businesses without a physical presence in a State cannot be subject to a State sales tax. These holdings struck a delicate balance with respect to the Commerce Clause and Federal-level vs. State-level power to regulate commerce. Justice Thomas writes a brief concurrence to explain the evolution of his thought on the merits of Quill since 1992. As with Kennedy, Thomas sees a changed commercial landscape, and cannot vote with his younger self, nor on stare decisis grounds, in the Internet-enabled marketplace of the current era. Roberts is concerned about the reaction the internet-based economy may have to such a monumental shift in tax burdens. Additionally, many large online retailers, including Amazon, already collect and remit sales taxes to States. More crucially, though, Roberts cautions that overturning stare decisis should not be undertaken here. A more appropriate response would be to leave this to Congress to resolve. This is especially relevant, because of the efforts underway in the current Congress to do just that. The narrow ruling in Lozman easily explains its near-unanimity. 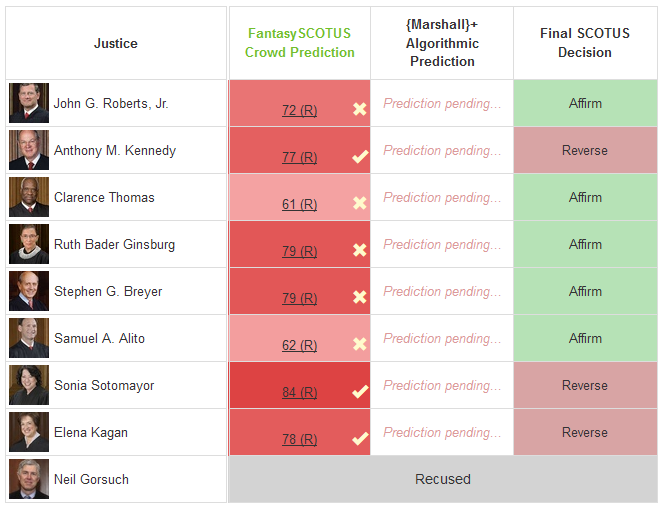 Kennedy’s majority opinion doesn’t say much, but it does establish that all of the Justices (except Thomas) likely wanted to avoid a more concrete ruling in such a unique case. Meanwhile, the Crowd didn’t have too tough a time with Rosales-Mireles, and they also fared rather well with Pereira v. Sessions and Lucia v. SEC. The other cases this week, however, posed a bit of a challenge. In Chavez-Meza, we see one of the weirdest splits in some time: Breyer and Ginsburg joining Roberts, Thomas, and Alito. Meanwhile, Sotomayor and Kagan joined a dissent from Kennedy. Gorsuch recused (this case came through Gorsuch’s erstwhile Tenth Circuit). It’s unclear what the Crowd was thinking here; a casual observer could swallow the pill that a majority of Justices would defend concepts that help to underlie judicial discretion. Fittingly, the Justices skirted the very idea of partisanship, in a mostly unanimous opinion that rebuffs the leverage of political parties as grounds for standing. This is not what most Court watchers thought would happen, but on the other hand, we’ve seen maneuvers like this from SCOTUS before. This same week, in fact. Partisan gerrymandering is a touchy subject, though, and the Justices bring a nimble touch. Congress and the Executive are the political branches, but the law is a different sort of master. The Crowd did a great job thinking a little outside the box. 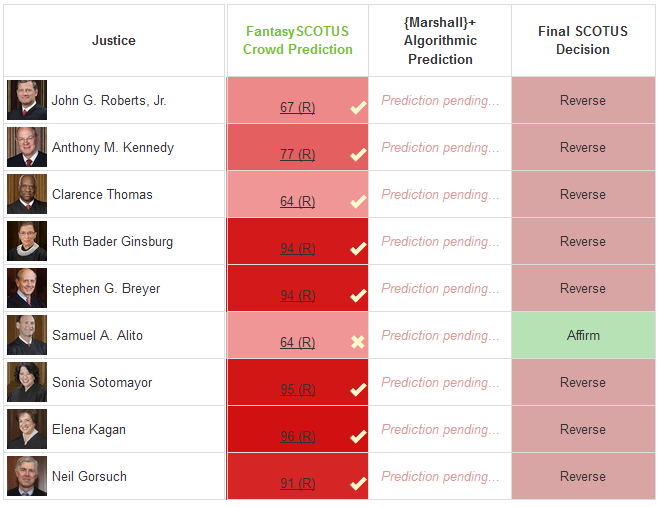 The main hiccup in this otherwise even-handed prediction concerns Justice Alito. 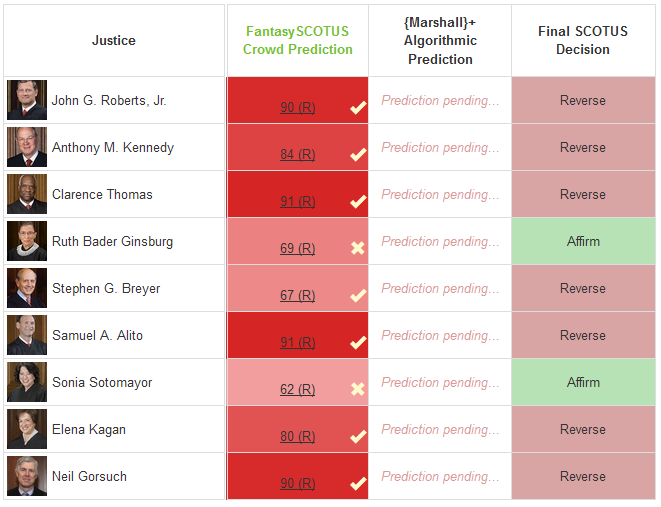 On the one hand, Alito often takes the side most favorable to big businesses. On the other hand, a conservative reading of the Commerce Clause, and the ramifications of affirming in this case, were the likely reason for Alito ruling against the respondents. Wow, what a week. In total, the Crowd only batted .500 on 8 cases, with a relatively low justice accuracy percentage. That said, this late in the term is where the rubber meets the road. We’ll be back next week with the latest on the Supreme Court. 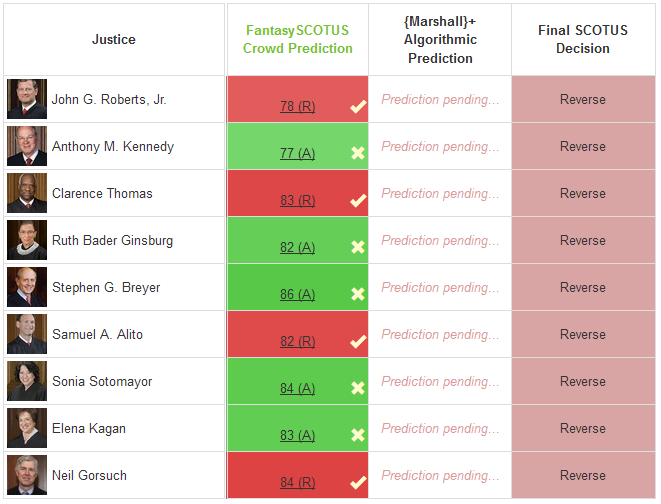 Keep track of the Crowd by following us @LexPredict and @MarshallPlus. 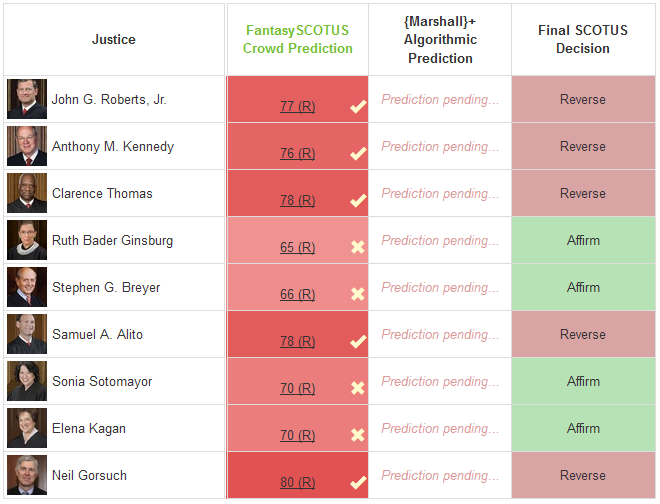 And you can always join up with the Crowd for free at the main FantasySCOTUS site. We’ll see you next week.